Nuclear factor-erythroid-2-related factor 2 (Nrf2) is a binding protein that plays a significant role in the antioxidant response of the body. It is the primary cellular defense against the cytotoxic effects of oxidative stress. This key protein rests inside the cell and is unable to move or operate until it is released by an Nrf2 activator. Once released it migrates into the cell nucleus and bonds to the DNA at the location of the Antioxidant Response Element (ARE), the master regulator of the total antioxidant system available within each cell. Studies suggest that Nrf2 plays an important role in supporting the activation of cellular antioxidant systems as well as inflammatory balance. A number of fruit and vegetable compounds have been shown to increase Nrf2. It is believed that these compounds have a protective effect on the body, maintain a healthy cycle of inflammation, and induce cellular longevity. 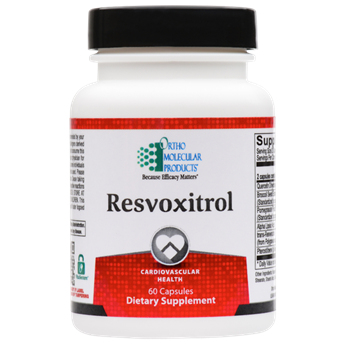 Resvoxitrol is a unique combination of phytonutrients designed to enhance antioxidant potential by stimulating Nrf2. This exclusive blend of pterostilbene, resveratrol, broccoli seed extract, pomegranate and alpha lipoic acid has a wide array of biological activity including direct free radical scavenging potential as well as inducing intracellular antioxidant production. These potent phytochemicals are the basis of many “superfoods” and have extensive, peer-reviewed research supporting their dramatic effect on cell health and longevity.